Fromdistance is a software company which makes products for mobile applications. Our main product is the Fromdistance MDM (Mobile Device Manager) – a tool for managing mobile devices. Based on this , we have built the Fromdistance Mobile Professional Reporter (MPR) and the Mobile Citizen Reporter (MCR). The first is used by several media companies for their own content production; the latter is a service for publishers to get content from end users. Both services transmit images and videos in their original quality without sacrificing resolution – making a sharp contrast with using MMS. Using the MPR service professional journalists can create instant reports for their publishers extremely easily. We can automate the whole process to a point where only the recording button on a mobile device is used – everything else is 100 per cent automatic. In professional reporting it’s vital to have tools that work. As the MPR is based on our mobile device management product, we can take care of the devices and of the user like never before. For instance, remote desktop access can be established to devices to help reporters in trouble. Citizen journalists can take advantage of the reporter service, as it can be used to send images, videos and text to a publisher of their choice. The user is asked to accept the terms set by the publisher during the submission process, which eliminates rights-related questions. Live streaming is in the works. We believe that mobile devices and mobile networks facilitate new ways of content production, both in terms of processes and in terms of concepts. However, it’s important to ensure the technical quality of the material sent out – normally publishers don’t want scores of low-quality content. We also want to help publishers in receiving material from end customers in order to get their stories heard. While traditional blogging is good, we would want to combine user generated content with professional publishing. video formats and level of integration needed. 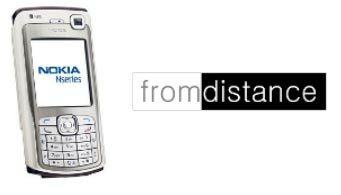 Fromdistance MCR is free for end users. They only need to pay for the generated data traffic. Publishers/media companies are our customers and pay monthly fees for using either service. This entry was posted in Citizen journalism, Handy tools and technology, Mobile and tagged Fromdistance, Innovations in Journalism, journalist, media, mobile device, mobile device management product, mobile devices, Mobile Professional Reporter, Publishers/media, reporter, software on March 28, 2008 by Laura Oliver.